THE Indian tectonic plate smashed into Asia some 55 million years ago. A ripple of geological events followed, creating the Himalayan mountains and Tibetan plateau over 40 million years. Geologists could figure out how the highlands were formed, but disagree on the timeline of their formation. Evolutionary biologists from China and USA recently stepped in to settle this row with the help of an obstinate frog. We used the descendants of an ancient frog tribe, Paini, as surrogates for time machine, said David Wake, herpetologist and evolutionary biologist at University of California, Berkeley. Paini frogs could act like time machine because they remain fixed to their habitat despite environmental changes. Several Paini frog species are known to exist in the Himalaya, Tibetan plateau, Hengd-uan mountain range and Indochina. To understand their evolution, scientists studied the genome of all the 24 species and analysed when they branched off. The changes when compared to the movement of the Indian tectonic plate remained consistent with a less accepted geological theory that the Indian plate’s push was in a series of fits and starts and not continuous, they noted in the Proceedings of the National Academy of Sciences on August 3. The Paini frogs arose in what is now Indochina and spread to western China. The first split occurred 27 million years ago: The group in western China evolved into highland genus, Nanorana, as the region rose to form the Himalayan-Tibetan plateau. Around this time the Indochina block was pushed towards the Pacific Ocean and the rest of the Paini frogs evolved into lowland genus Quasipaa. The Nanorana diversified again 19 million years ago as the Himalaya continued to rise. 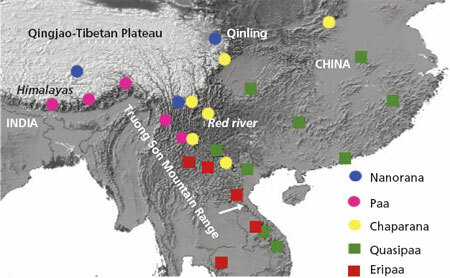 Two groups got isolated in the Himalaya and the upper Tibet, adapted to the cold and low-oxygen region, and evolved into subgenera Nanorana and Paa. The rest of the Nanorana on the lower Tibet evolved into species under Chaparana genus nine million years ago when the region rose to attain its present height. Quasipaa also diversified to form a new subgenus, Eripaa. Their split was consistent with the formation of the Truong Son Range, separating the western highlands of Laos from Vietnam’s lowland. The breaks in the evolution of Paini every couple of million years suggest the Indian plate’s push was in fits and starts. As it pushed the Himalaya up, southeast Asia and China were pushed aside towards the Pacific Ocean. And all along the frogs stayed put.